“Jesus calls us to follow him. That is an action, a decision that implies a way of life,” Archbishop Gomez said during a plenary session July 3, the third day of the convocation. “They are places on a map, places where people live. The peripheries are parts of our cities and the rural areas that we never visit. The other side of the tracks. They are where the poor live. They are the prisons and the tent cities in our public spaces. The peripheries are the bitter fruits of neglect, exploitation and injustice. They are all the places our society is ashamed of and would rather forget about,” he said. “But for Pope Francis, the peripheries are more than a physical location or a social category. They are places where poverty is not only material but also spiritual,” he said. The archbishop called such locations places where people “are wounded and feel their life has no meaning and makes no difference,” trapping themselves in sin, addiction, slavery and self-deception. “The pope is saying these peripheries are growing in the modern world and these peripheries are new mission territory,” he explained. 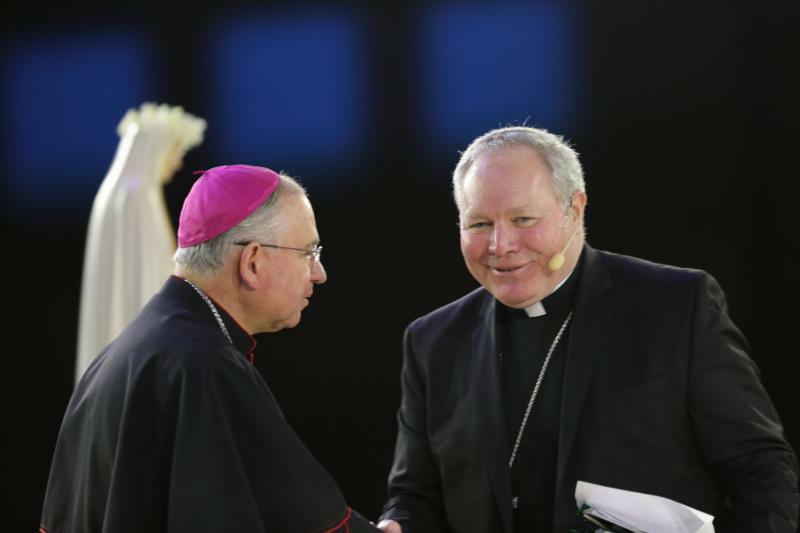 Archbishop Gomez, vice president of the U.S. Conference of Catholic Bishops, admitted some of these places are “where the church does not like to go, where we do not like to go.” Yet, he reminded the 3,500 delegates, Jesus is at the margins, and that as people of faith, they are invited to go where Jesus exists. “The church has always been present in the peripheries, through our schools, our parishes and our ministries. Sometimes we are the only ones serving these communities. But we can do better, we are called to do more. That is our challenge,” Archbishop Gomez said. “With the loss of God, we are witnessing the loss of the human person,” he said. “This is one of the lessons from the last election, wasn’t it? America is pulling apart. We are a people divided along lines of money and race, education and family backgrounds. People are afraid of the future. They feel powerless and excluded,” he told the convocation. He said Pope Francis and his predecessors, Pope Benedict XVI and St. John Paul II, have urged action for society’s forgotten communities. He suggested marginalized people can be as close as the person next door.